This Sunday is the Third Sunday of Lent. On SundaySchoolUpdates.com we are learning about Jesus through the Mysteries of the Rosary. 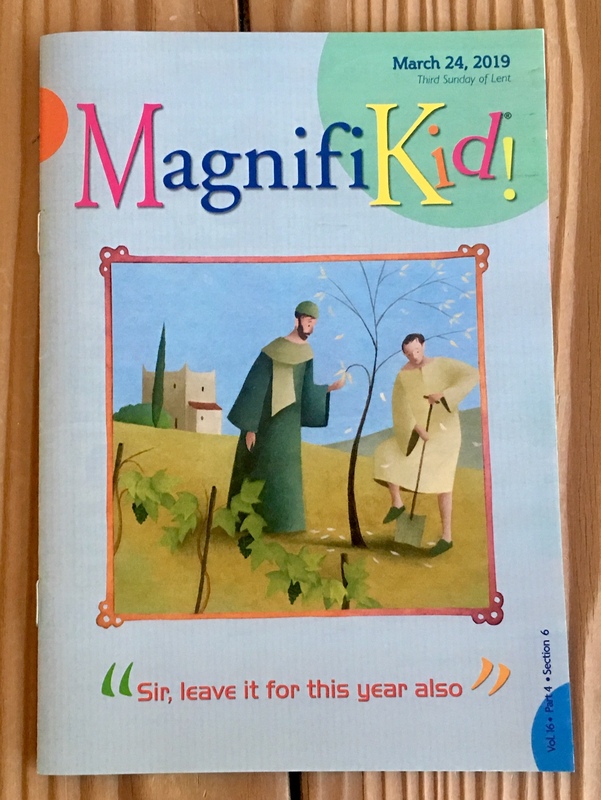 This week is about “The Carrying of the Cross.” “The Sorrowful Mysteries” of the Rosary are, indeed, sad and difficult to comprehend for young children. My hope is that your children will be prepared for Holy Week, knowing in advance what Jesus faces, and be ready to celebrate on Easter Sunday, full of joy and hope. Note* Letters and numbers are placed by the USCCB for links and footnotes to help the reader. This week we learn about “The Carrying of the Cross.” The full reading above is not for young children. 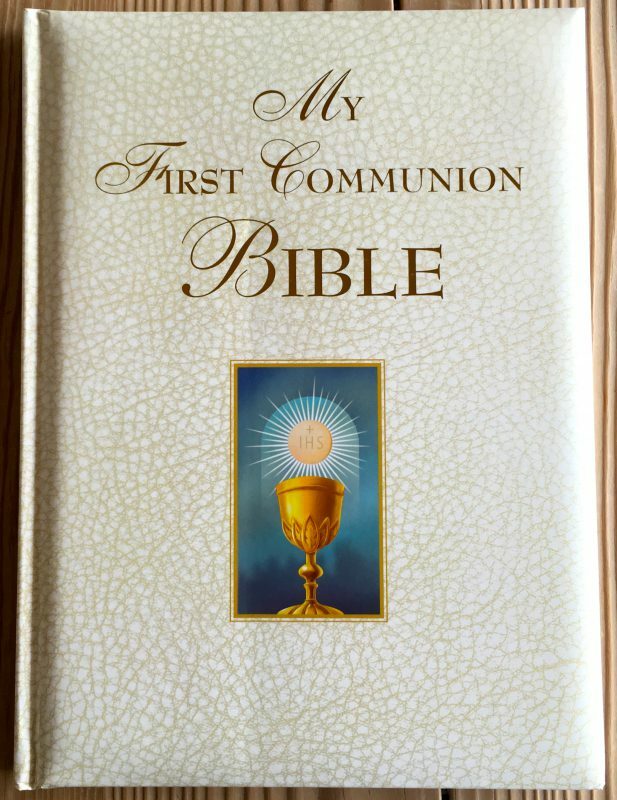 Please read them the excerpt below My First Communion Bible. “Pontius Pilate’s soldiers tied Jesus to a pillar and whipped him. Then they put a scarlet robe over his wounds and pressed a crown of thorns onto his head. ‘Hail, King of the Jews!’ they mocked. Then they continued to beat him with reeds and sticks. When they were tired, the soldiers put Jesus’ own clothes back on him and laid the heavy cross on his back.They made Jesus walk through Jerusalem to Mount Calvary where he was going to be crucified. While they were walking, the soldiers forced a man named Simon of Cyrene to help Jesus carry the cross. 4 O precious cross! O glorious crown! 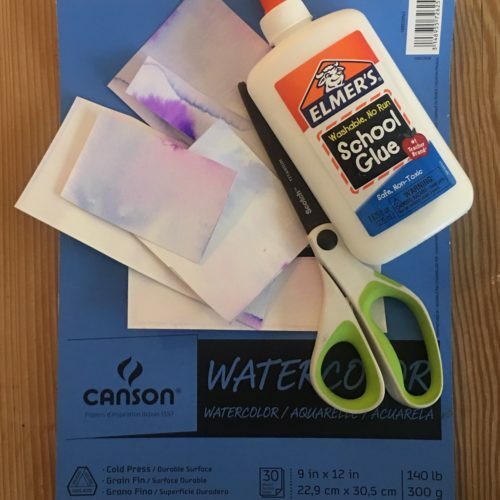 You will need two pieces of watercolor paper. 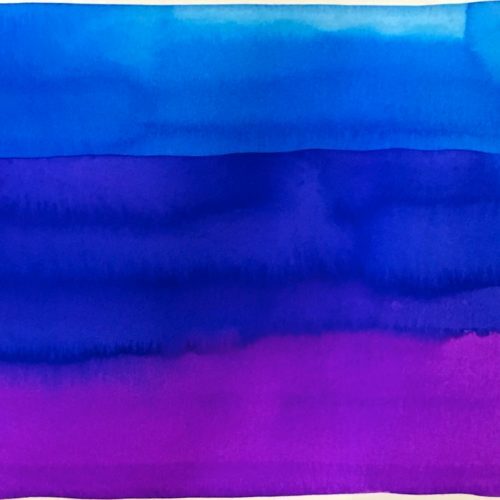 On the first sheet, invite your child to use purple watercolor mixed with blue, gray or black to paint a solid “Lenten” background. Let dry thoroughly. 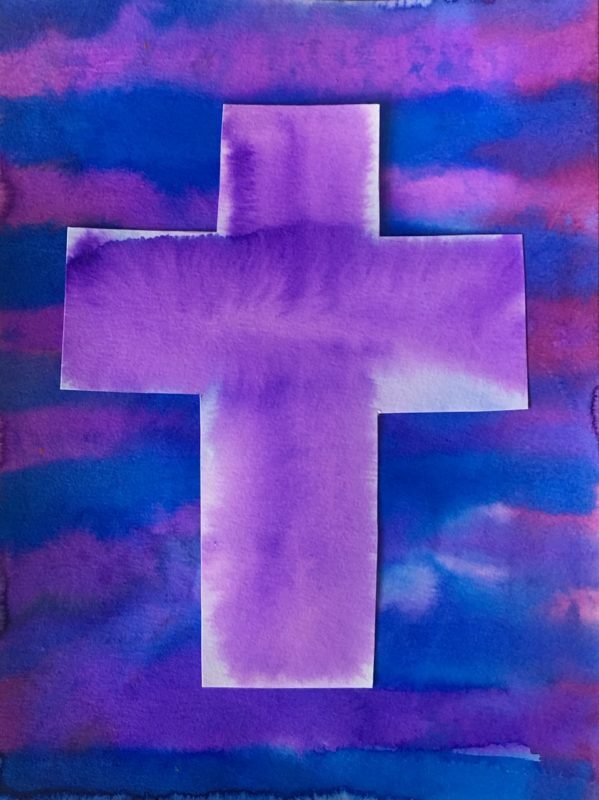 On the second sheet, paint a large cross using lighter purple or lavender colors. 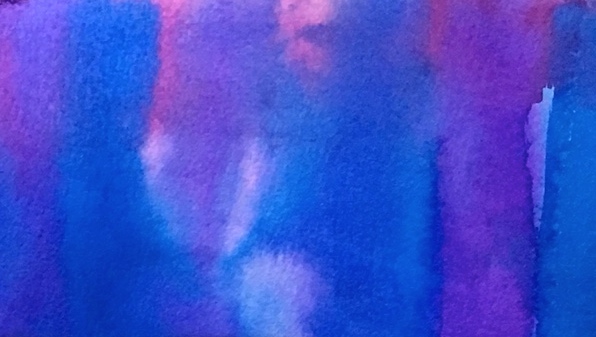 I used liquid watercolors because I love their strong pigments. Let dry. When both sheets of paper are dry, draw or trace a a big, wide cross in pencil on the back of the lighter color sheet. Cut it out. Then glue the cross onto the dark background painting, with liquid school-type glue. Press down carefully. I use a plastic cutting board, placed on top of glued down cross, to press down on it so it doesn’t curl up. Add a few books on top of the cutting board to add weight. In a couple of hours it should be set. 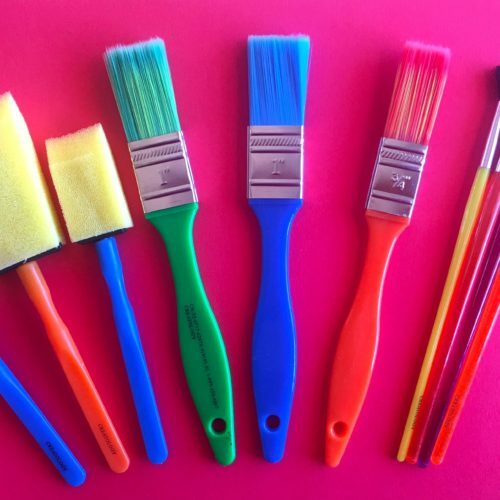 If the glue is still wet, let it air dry, as is. 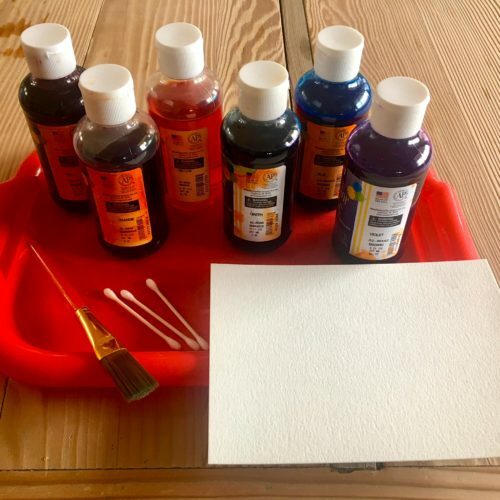 If you don’t have a Lenten booklet or journal, write this exercise on the back of your art project before you start to paint, or when it is dry. This week, encourage your children to discuss the meanings of almsgiving, praying, and fasting. Help them find opportunities to participate in these three activities.